The Two of Wands. Dominion. Strength. Will. Boldness. Drive. Exploration. Power. Control. Force. Destruction and Creation. The card Dominion corresponds to the Sefirot of Chokmah; the active masculine, creativity, and wisdom. Chokmah is the first of the Sefirot to be made of something other than the pure, abstract force of the suit; it is the pure idea; however, rather than justbeing the idea, this is the first manifestation of the idea that we can see; as opposed to the more abstract concepts of the Ace, we can see the effects of the Two upon our world much more easily. 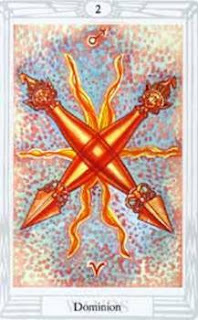 The Two of Wands shows how the suit of wands first appears in our lives, and is the original harmonious idea of the suit. Like the Ace, the Two is mostly abstract, and instead of being an emanation, like I said, is a manifestation. The suit of Wands and the element of Fire in their pure idea form are molded into personality traits and characteristics in the Two; the creative force of the Ace becomes the act of creation and destruction, the active force of the Ace becomes will, control, and power, while the passionate force of the Ace becomes also will, drive, and exploration. The Ace’s aspect of pure courage becomes the somewhat less abstract boldness, as well. Essentially, the two of Wands is like a diluted version of the Ace; still with many of the ideas, but slightly more tangible and toned down. It still has great power, however, and a special place as the first manifestation of a suit’s energies. As Chokmah, the two also represents the line, and the first concept of distance. The point of Kether is an abstract concept in the nothingness, infinitely small, but the line represents the first thing that can be measured and seen, and these qualities express themselves in the Two. In a reading, the Two of Wands generally points to the issues of power, boldness, acts of creation and/or destruction, and will or drive. It also can indicate the desire or need to explore new paths or territories, to travel down uncharted seas in the journey of life. Reversed, the Two indicates to me that these energies are struggling to be expressed, or advising that they have become too dominant in you and suggesting you to tone them down. The art of the Rider-Waite card depicts a man holding the world in his hands suggesting power and control, while simultaneously looking out to sea; which to me always suggested exploration. The Thoth illustration is not quite as easy to interpret, and my interpretation of it comes mainly from Crowley’s theories and the Sefirot; two crossed wands with lines of power coming from them; a sign of strength, control, and power.